Arising from the depths of the underworld on the hot winds of Horus, the metal warriors of Nile have struck a powerful blow for the gods of ancient Egypt. This American death metal band has plundered the tombs of the pharaohs for inspiration and created a new genre of brutal music that takes its cue from an empire that is long dead. Nile's career is anything but dead. They have become the biggest success story in death metal over the last few years and it seems fair to say that they are on the verge of surpassing Cannibal Corpse as the genre's number one band. Their unique combination of traditional Egyptian music with the roaring thunder of extreme metal has surely struck a chord in the public and their latest opus "In Their Darkened Shrines" sees them going even further into the Land of the Ancient Kings. I mean, the liner notes on this sucker read like a college history text! I find the faster material on the record to actually be fairly forgettable, as it all sounds similar to what Nile were doing on their previous two albums. However, on the tracks that slow down a bit, a sizable amount of brooding atmosphere is added, giving the band a heavier sound and a more memorable feel. I'd cite the sludgy "Sarcophagus" as the perfect example of Nile using slower riffs and ethereal choirs to create a powerful track. The final four part title track unfolds with the grandeur and suspense of a Cecil B. DeMille movie, moving from creepy, completely Egyptian ambience to scorching speedy death to a crushing doomy finale...truly, Anubis himself must be smiling after hearing this sort of grim tribute! If you can handle the combination of Egyptian atmospherics and flesh-ripping death metal, "In Their Darkened Shrines" should ignite a fire within your soul. But if you like more traditional and staid death, then avoid this like a plague of locusts! This is molten hyperspeed death metal at its most furious. The Egyptian feel in the riffing is immediately apparent, but I find the track rather lackluster due to its chaotic construction, which gives it an unfocused feel. Another brutal screamer, this is shorter and more to the point than the opener. It's pretty typical of Nile's faster tracks. The album comes into its own with this bone-crushing dirge. 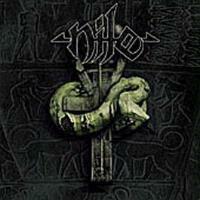 The slower, doomier riffs allow the majesty of Egypt to creep into the songs. Sanders' vocals are at their most guttural, and the tune is really aided by the haunting choirs that appear towards the end. This is one of the better tracks the band has ever done. According to the voluminous liner notes, this phrase refers to a particularly gruesome torture the god Osiris inflicts on those who rebel against him. The track is more scorching death metal, with a cool bit where the song's name is chanted rhythmically against the riffs. This is a truly immense 11 minute plus epic that describes the tale of a pharaoh so hungry for immortality that he devours the gods themselves, becoming an implacable monster. The tune begins acoustically, switches to full blasting mode, and drops in intensity. The track has many hills and valleys, creating a cinematic feel, which is something 95% of death metal bands wouldn't have a clue on. An atmospheric passage towards the end features some bizarre narration and some authentic ancient war horns. The final procession of riffs is very catchy and Egyptian in the extreme. This may be the single most brutal track Nile has ever performed. It is skull-crushing death metal from the get-go and for once, the Egyptian tone is almost non-existent (though the lyrics are still drenched in it). This is a good exercise in pure raw destruction. This tells the story of Nectanabus, the last pharaoh of Egypt, who dominated his kingdom with the help of necromancy. The opening riffs are just awesomely heavy and morbid, but then the tune turns into a mysterious ambient passage where a dry, creaking voice intones an invocation to dead spirits. This is pretty creepy stuff, not really metal at all. Those monstrous doom riffs return later on to good effect. This is not quite as brutal as the other tracks, but it's still death metal. It actually reminds somewhat of how the other Middle Eastern metal band, Melechesh, writes. It's a bit more complex, with lots of guitar soloing. The title track is a multi-part epic that breaks down into four separate tracks. Taken as a whole, it is perhaps the most ambitious song ever attempted in death metal. Not metal at all, this is ambient weirdness that oozes a feeling of ancient dread. It tells of a subterranean chamber where the mummified bodies of reptilian gods are enshrined. Plenty of chanting and eerie sound effects make you feel like you are in that evil chamber yourself. The guitars come rolling back in with a strong military drumbeat. This is mid-tempo death metal where the music conveys the story as much as the lyrics. Some incredible double bass drumming announces this powerful, fast death metal track. It's all the more potent because it doesn't drag itself out too much. This mournful, doomy instrumental ends the title track and the album. It sounds a lot like an Egyptian version of Candlemass, with plenty of classically-tinged guitar soloing. Some appropriate keyboard work adds to the gloom. A very strong track, this reeks of the grandeur of the Ancient Empire. It makes for a fitting conclusion to one of the most ambitious metal albums ever written.